1854 – Joseph Charles Price was born in Elizabeth City, North Carolina. Price was a great orator and was one of the founders of and was the first president of Livingstone College in Salisbury, North Carolina. 1927 – Noted opera singer Leontyne Price was born. In her career she would win 19 Grammy Awards and was later awarded Presidential Medal of Freedom (1964), the Spingarn Medal (1965), the Kennedy Center Honors (1980), the National Medal of Arts (1985). 1940 – Singer Roberta Flack was born in Black Mountain, North Carolina. She had five number one singles and received four Grammy Awards. 1964 – The United States House of Representatives passed the Civil Rights Act of 1964 after 12 days of debate and voting on 125 amendments, by a vote of 290-130. The bill prohibited any state or local government or public facility from denying access to anyone because of race or ethnic origin. It further gave the U.S…. 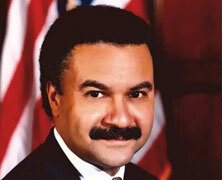 1989 – Attorney Ronald Brown was elected national chairman of the Democratic Party and became the first African American to hold the post. In 1993, Brown was appointed by President Bill Clinton to serve as the Secretary of Commerce . He served in this capacity until his death in 1996 in a plane crash in Croatia. 1992 – Alex Haley, renowned author of the book ROOTS as well as “The Autobiography of Malcolm X” died in Seattle, Washington. He won the Pulitzer Prize for ROOTS in 1977, and TIME magazine ranked “The Autobiography of Malcolm X” as one of the 10 most influential nonfiction books of the 20th century.